Home » We are Lyon » Is Bordeaux as similar to Lyon as people say? Bordeaux might be on the other side of the country, but that doesn’t stop it from being a great weekend trip destination for people coming from Lyon. It’s only an hour away by plane and is historic, beautiful, and quite a bit closer to the beach. When you grow up on the east coast of the U.S., it isn’t exactly common to take a weekend trip to the other coastline. I mean, people do it, but it isn’t quite the same thing as a city break to Cape Cod or the Hamptons. The one time I took a weekend trip from Massachusetts to visit my friend in Portland, Oregon, the one response I got from people on the east coast was, “Oh, you mean Portland, Maine?” No, not exactly. But taking a weekend trip to the other side of France isn’t so daunting, especially when Lyon to Bordeaux is the equivalent of Boston to Philadelphia. Pack your weekender bag, we’re going on vacation. Because Bordeaux is so weekender-friendly, people also have plenty to say about it. Lyon-dwellers frequently compare it to Lyon, and the two words most often used to describe it include bourgeois and low-lying (more on that later). So how does it actually stack up (literally and figuratively)? Let’s take a trip to bougie bliss, shall we? The first thing that everyone told me I’d find in Bordeaux were wide and roomy streets. While that definitely proved to be true, there was one thing everyone conveniently left out. There might be a lot of wide streets but there are a heck of a lot of curved streets too. And curved buildings, for that matter. Basically everything is built on a curve. I’m probably exaggerating (probably). But you certainly won’t be finding a “centre-ville” with nicely gridded streets. I guess coming from Boston, land of the convoluted road systems (if you’re going up or down or anywhere but straight, you’re going somewhere else) I should have been prepared, but Lyon has softened my hard, New Englander shell with a Presqu’île full of straight streets and an old town that’s essentially two main roads plus alleyways. 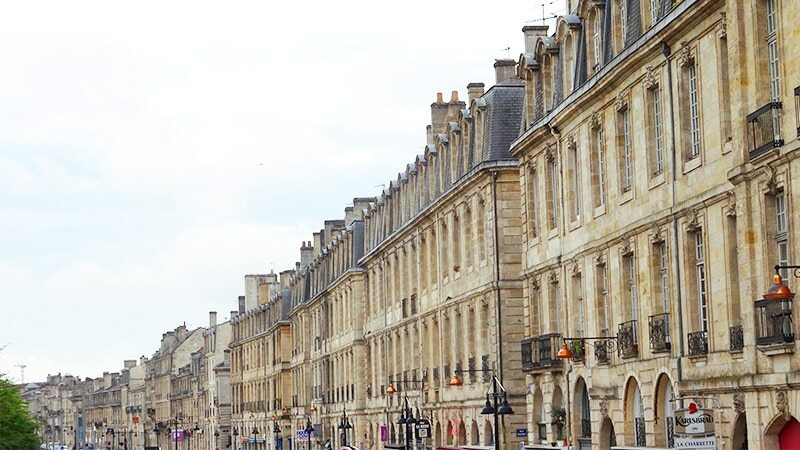 I got turned around more than once in the center of Bordeaux, thanks to aforementioned curved streets and the notable lack of hills with which to situate myself. Speaking of hills, that brings us to Bordeaux’s next curious feature. That is, there are none. Bordeaux is flat. There won’t be any Montée de la Grande Cote and funiculaire for Bordeaux-dwellers (Bordelais?) because there’s no need. In addition to being as flat as the Earth before circumnavigation, Bordeaux is also low to the ground. By that I mean that thanks to building height restrictions you’re not going to find a building over four or maybe five stories (American stories, that is). I didn’t manage to learn exactly why that is, but it makes for a uniform and slightly disconcerting landscape. Apartments on the rez-de-chaussée, you exclaim? What can I say. Those Bordelais are living in a scary world indeed. In other news, the buildings also all look remarkably similar, with grey-brown stones, balconies, and wide windows that make it look like you’ve stepped into a fairytale village that never ends. Bordeaux doesn’t usually come up when we talk about the biggest cities in France, but it’s city center makes it feel like it should. Lyon felt big when I first moved here, but Bordeaux feels bigger, thanks to those wide streets and a massive pedestrian center. From the public gardens to the Rue St-Catherine and over to the Place de la Bourse, my legs are jello. Or maybe I’m just out of shape but we’re going to go with the “big city center” thing. 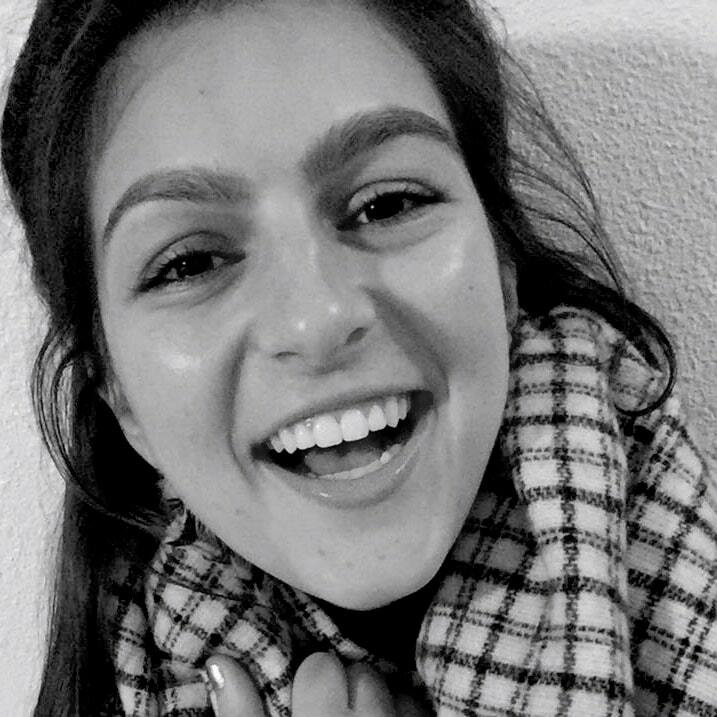 Humor me. Speaking of the Rue St-Catherine, it’s the longest shopping street in the city, in France, and possibly even in Europe. And most of the stores are even open on Sunday. Take that, Rue de la République. Bordeaux’s outdone you on this one. Ah, the bane of French travel: strikes. This spring and summer seem to be particularly bad, and in an effort to avoid the train strikes happening the day I left I booked a flight instead. I’d definitely recommend doing this anyway, as it’s a lot faster than trains and buses and doesn’t make much of a price difference. A flight from Lyon to Bordeaux takes about an hour, while trains take around five and buses can be up to fifteen. Plan accordingly. But be warned: just because you avoid the rail system doesn’t mean you’re about to beat the French system. Nope, they saw you coming from 300 miles away. The day before my flight out of Bordeaux, my travel app kindly informed me that flights may be delayed or canceled due to a planned air traffic control strike affecting the French airspace. Even flights not going to and from destinations in France might be affected, since many of them pass through French airspace. Okay, I’m sorry. I know the right to strike is one of everyone’s favorite French pastimes. But who decided it was okay to put the entire French airspace on strike? IT’S AIR. IT CAN’T BE ON STRIKE. IT DOESN’T EVEN KNOW WHAT A STRIKE IS. Maybe that 15-hour bus isn’t so bad after all. Right? 5. 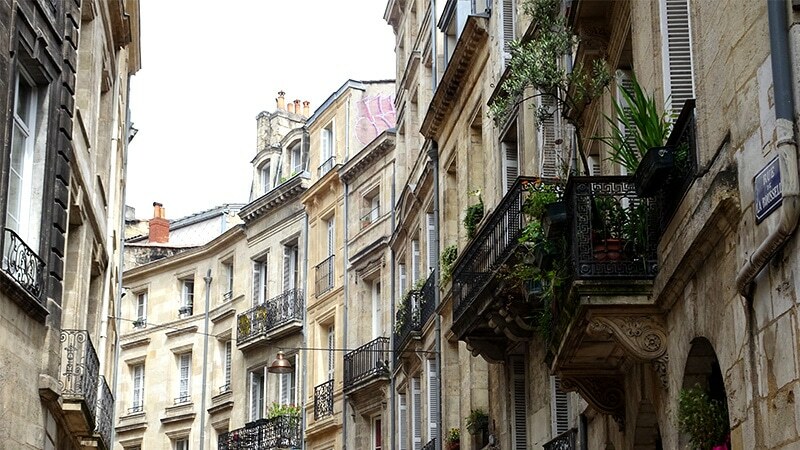 Bordeaux isn’t on the coast, but you might as well go visit while you’re there. Yes, I knew going in that Bordeaux isn’t exactly a seaside city. I took a geography class at some point, okay? But Bordeaux is a lot closer to the ocean than Lyon is, and if like me you’re missing the sweet smell of saltwater in the morning, it’s definitely worth a trip to the beach while you’re in the area. Train from the Bordeaux St-Jean train station to the seaside town of Arcachon leave every hour, and there’s no need to buy tickets ahead of time so it’s easy enough to go on a whim if you get bored or tired of the city for a day or an afternoon. Just hop on that automatic machine at the station and you’re on your way to the west coast. The journey takes an hour and drops you off at a train station that’s a quick ten-minute walk from the beach. 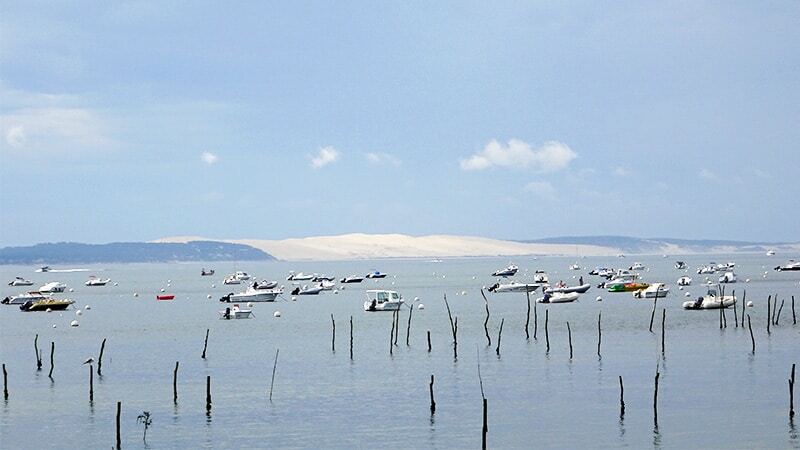 There’s also shops, a boat across the bay to Cap Ferret, and a bus to the Dune du Pilat (ie. the biggest sand dune in Europe!). It’s 110 meters high, in other words about 360 feet, so get ready for a workout, followed by a much-deserved plunge into that ocean you came out here to see. After all this, I’m prepared to admit that Bordeaux does in fact live up to the expectations the Lyonnais set for it. I’m not convinced it bears much of a resemblance to Lyon, but it is beautiful, as bougie as everyone said it would be, and definitely worth a weekend visit. For now, it’s back to Lyon for me, where the streets are straight and the buildings are high(er).